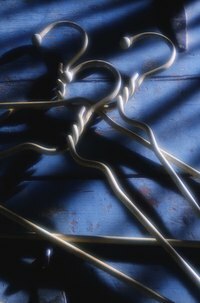 Wire coat hangers can become a tangled mess, become worn and bend easily, and also can leave rust marks on your clothing in humid closets. While you may not want your wire hangers anymore, they can still be useful to someone else. Before you decide to throw out your old wire hangers, try some other ways to get rid of them first. Donate your wire hangers to your local dry cleaners. Dry cleaners use wire hangers to send back clothes to customers once they have been cleaned and pressed. Call your local elementary or high school to ask if it would like to have them. Many schools will use them for art projects or even science experiments. Check with your local waste management company to see if the hangers are recycled in your area. If they are, put your wire hangers out on the curb on specified waste metal pickup days for your neighborhood.